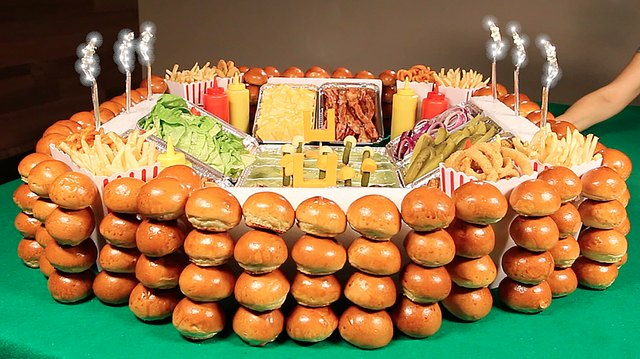 Be the MVP of your Super Bowl party by building this epic snack stadium featuring a gourmet slider bar with custom toppings. Please the crowd by offering a variety of burger options, such as beef, chicken and veggie patties. Sides like fries, onion rings and potato chips round out the menu for a winning game day feast. 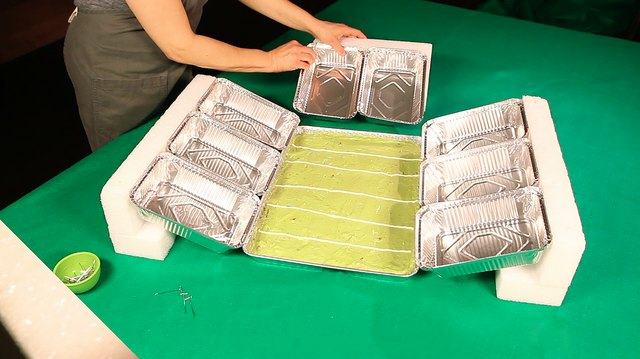 The amount of food and supplies needed will depend on the size of the snack stadium you choose to build and how many guests you need to feed. 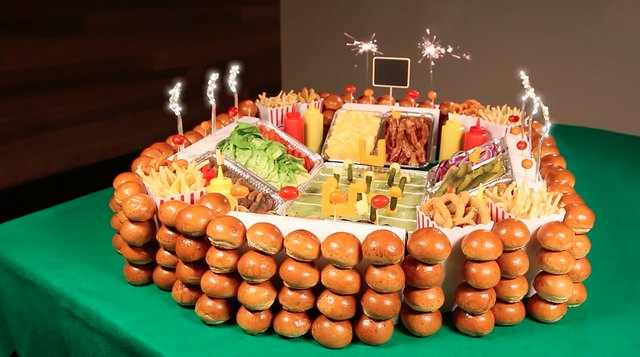 The stadium size featured here will feed a crowd of 50. Cover your table or counter surface with green felt. 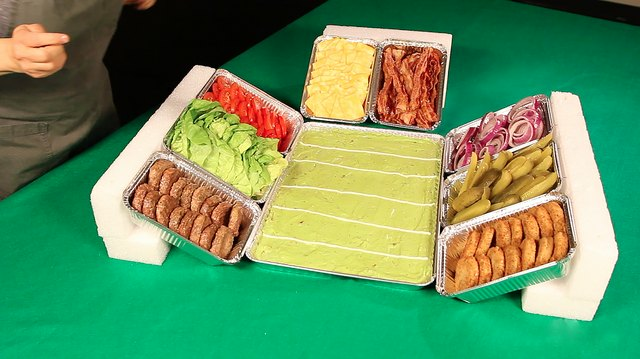 Place a shallow serving tray in the center, fill it with guacamole and pipe white lines horizontally with sour cream to mimic the lines of a football field. 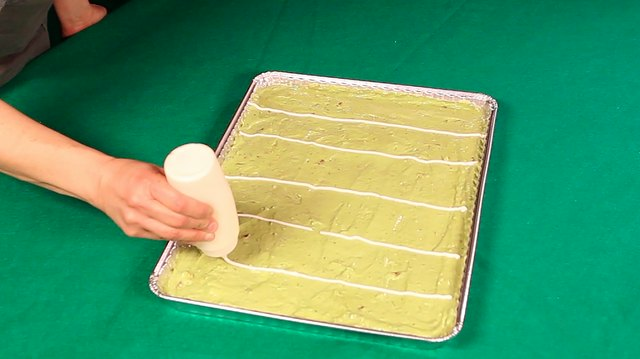 You can use a condiment bottle or piping bag to pipe the sour cream. 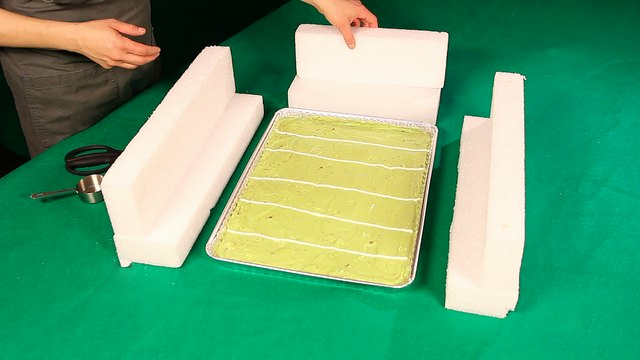 Use a serrated knife to cut the styrofoam blocks to fit the tray size, and then form an L-shaped styrofoam support for the four sides of the tray. Secure the foam blocks together with straight pins -- these will serve as the supports to hold the toppings for the snack stadium. Set serving trays on top of the L-shaped foam supports. 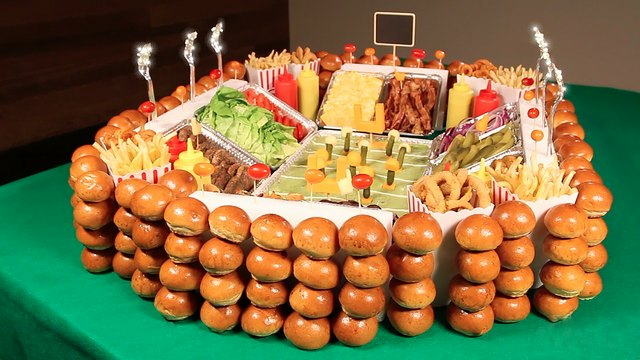 Fill the trays with a variety of sliders and gourmet burger toppings. Cut two U-shaped goal posts from blocks of cheese, and cut two 1-inch cheese rectangles to serve as the base for each post. Use a toothpick to secure the bases to the goal posts, and place a goal post on each end of the field. Mold a 1/2-inch cube of cheese into a helmet shape that fits on top of a mini pickle. Secure the bottom of the pickle to a 1/2-inch cube of cheese. Repeat 10 to 12 times. 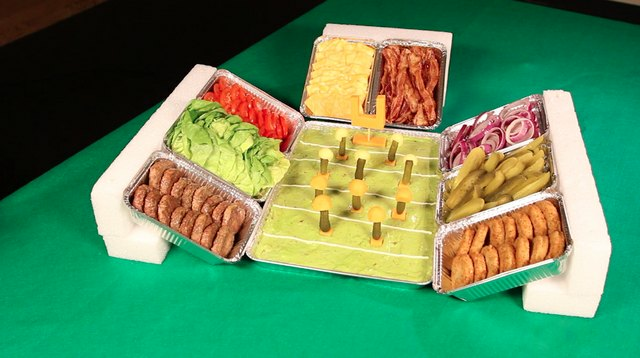 Arrange the pickles to serve as "players" on the field. 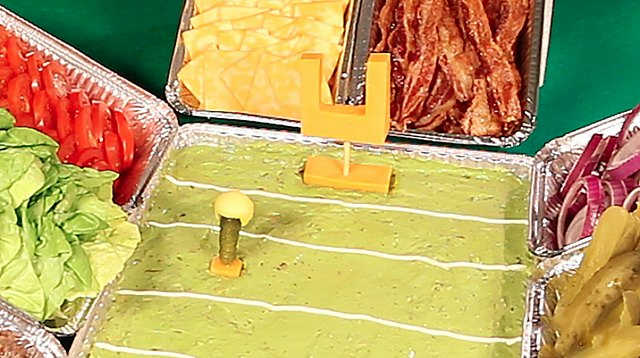 Use two different cheese colors for the helmets to signify opposing teams. 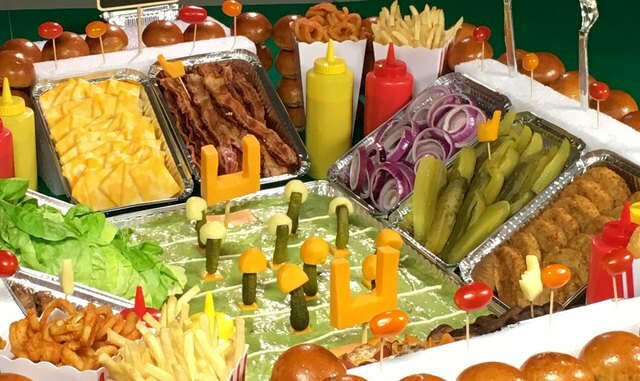 Fill in the blank corners of the stadium with ketchup and mustard condiment bottles as well as containers of french fries and onion rings. Tall popcorn containers work well for adding height. 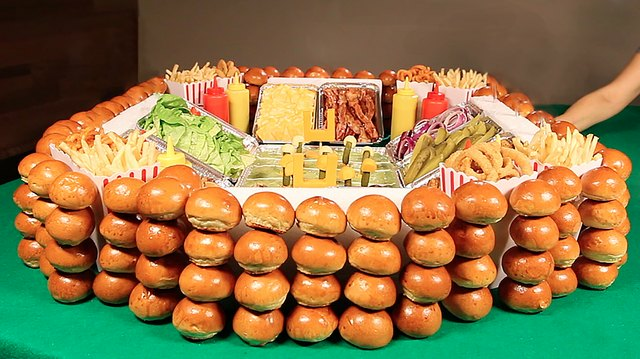 Surround the stadium with stacks of mini burger buns skewered together. Four mini buns per stack is a good height for a stadium of this size. 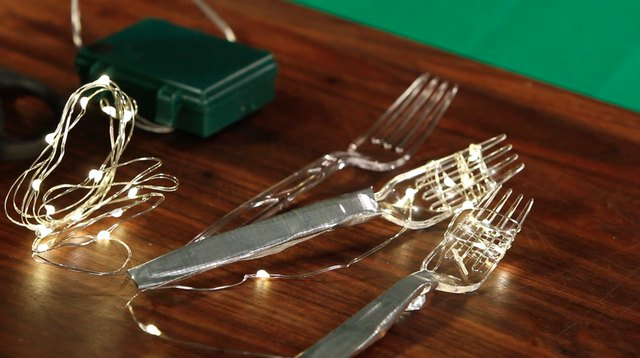 Wrap battery-powered LED lights around the tines of plastic forks and stick the fork bases into the styrofoam supports on each side of the stadium. Stick a mini chalkboard sign into the styrofoam on one end of the stadium to serve as the jumbotron. Write your favorite team name, custom hashtag, etc. Skewer cherry tomatoes on toothpicks to serve as colored flags around the top of the stadium. Carve a few cubes of cheese into foam finger shapes, skewer them onto toothpicks and place them throughout the stands. Stick sparklers next to the "jumbotron" and light them for the kickoff or halftime show! Use caution when lighting sparklers indoors. Have a cup or bowl of water handy right next to the sparklers for quick extinguishment. Some flying sparks may burn the table surface or felt. 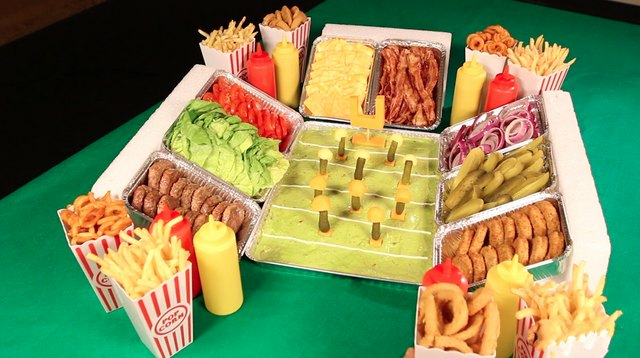 Your favorite team isn't guaranteed to win, but your snack stadium will most certainly be a big winner on game day! How do I Make Barbeque Sunflower Seeds?